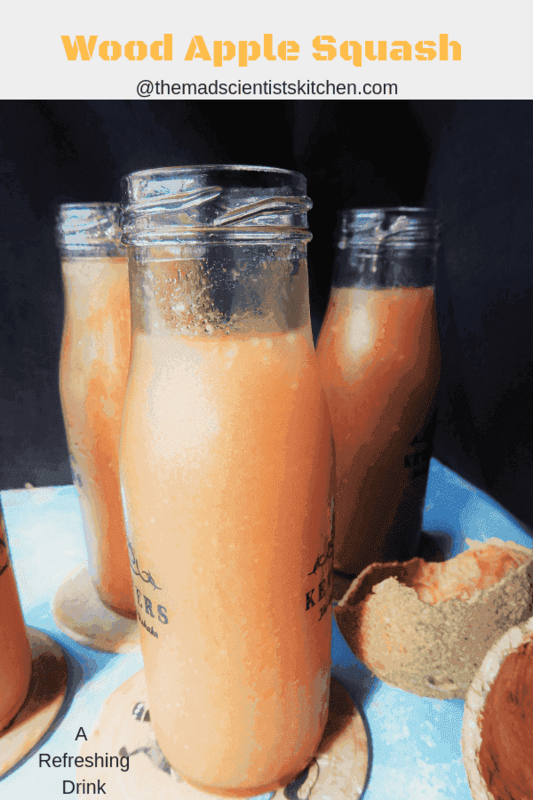 Bael Ka Sharbat is a traditional non-alcoholic summer drink you can serve your family. Bael is known by different names Wood Apple, Stone Apple, Bengal quince, Golden Apple, Japanese Bitter Orange. The aroma of the ripe fruit once the hard cover was broken is so heady, the fruit tastes sweet and tangy. In Hinduism the tree is considered as sacred and it is mentioned in the Rig Veda as the residence of Goddess Laxmi , the Goddess of Wealth. We all know that Bael fruit and leaves are used in the worship of Lord Shiv. In my recent trips up and down to Dharwad , my hometown were a too often as my father was not too well. In the last trip we went to “More” a supermarket close to our home and stocked up all the fruits and vegetables my father will need. I came across this beautiful fruit which we called bael ! As a child it was my favourite snack and we used to eat the bael “chori-chori” in school almost all year round whether ripe or raw a little salt and we were ready to go. Amma made some kind of chutney with it. 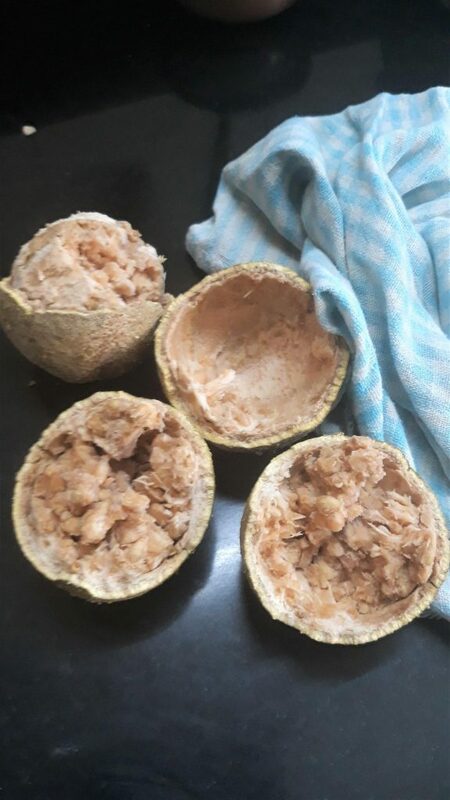 The fruits can be eaten either fresh from trees or after being dried and produced into candy, toffee, pulp powder or nectar. The leaves and small shoots are eaten as salad greens. Now I am trying to reduce my junk food dependence and hence made this Bael Ka Sharbat or Wood Apple Squash. One glass of this sharbat and my Elevenses is done. If a bit hungry drink one more glass low on calories and filling what else do you need? The fruit has a hard covering. Hit it on the floor and open it. Scoop out the pulp with a spoon and collect it in a big bowl. Mash the pulp in the water with your hands. Let it sit for about 30 minutes. Strain the mixture with a sieve and separate the seeds and fibre. Soak the pulp again and then strain it again. Add jaggery, lemon juice and the rest of the ingredients. Adjust water and the rest of the ingredients mix everything properly. Yes this is a very popular sherbet served in summers , I think it’s called kotha in Gujrati , and they make a very delicious chutney . Those bottles look lovely and the sherbet has a pretty colour . It is called kautha in Marathi. I remember my mother made a chutney with it. I had never heard of this drink. Sounds delicious – sweet and sour. Yes, this is new to me and I am loving it. I miss wood apple here, wish i get this fruit here. 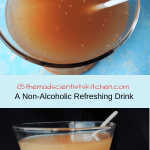 Bael ka sharbat looks absolutely ultimate and refreshing. True Priya we miss something we enjoyed as kids always. I have ever heard of the chutney made with wood apple. This beverage sounds good. Must be a good thirst quencher. It has been ages since I saw this fruit. 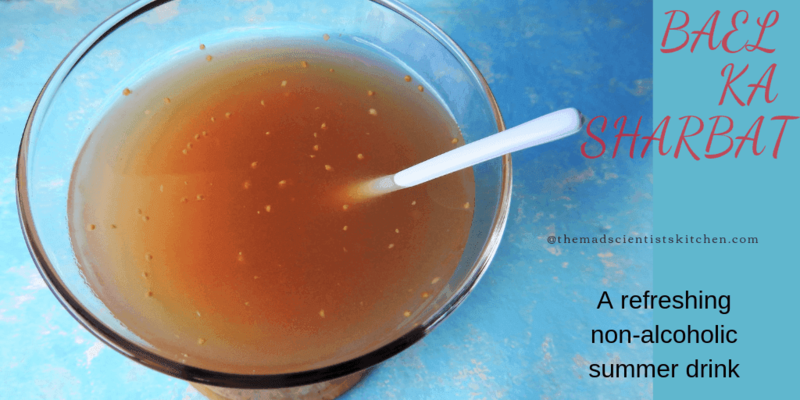 This beal ka sharbat sounds yummy and loved your traditional recipes this week. We get these only during Ganesh Chaturti. Next time I get one, I am definitely trying this sherbath. Oh, we always end up wasting the Bael fruit when we get it for Ganesh Chathurti..will make this next time we get it! We make wood apple pachadi always. 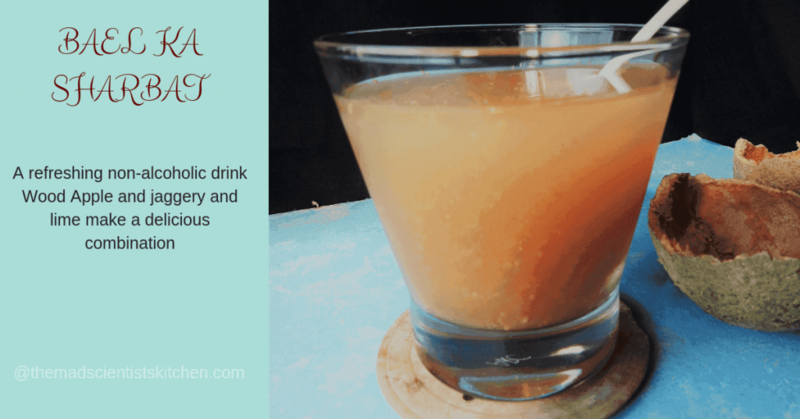 This sharbat sounds interesting and will definitely give it a try.